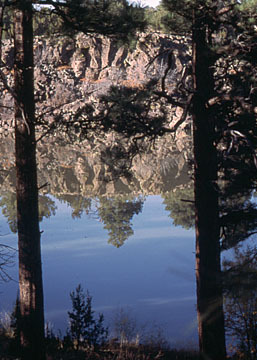 Fool Hollow Lake Recreation Area is located in the world’s largest contiguous belt of ponderosa pine forest. A relatively flat basaltic plateau, broken by Show Low Creek and Fool Hollow Wash, characterizes the property. Fool Hollow Lake was created by construction of a dam at the confluence of Show Low Creek and Fool Hollow Wash in 1957 by the Arizona Game and Fish Department with federal assistance. This created a 149 surface acre lake surrounded by National Forest lands. Fool Hollow first came to the attention of the Parks Board at its meeting on June 20, 1959. Director McCarthy advised the Parks Board that Fool Hollow and Show Low Lakes had a considerable amount of land around them for potential Park development. The Parks Board instructed the Director to advise the Game and Fish Department of the Board’s interest in these two areas as possible State Parks. The Parks Board made an on site inspection of Fool Hollow Lake during its meeting on August 1, 1959. With new Parks to be developed, budget limitations, and other priorities, these two sites were not pursued after appearing on the State Parks’ first Five Year Plan. In 1988, the City of Show Low began making agency contacts with the U.S. Forest Service, Arizona Game and Fish Department, and Arizona State Parks to promote the concept of an intensively developed and managed recreation area at Fool Hollow Lake. At that time, Fool Hollow existed as a primitive recreational opportunity and had become a source of concern for the community and the Forest Service as a result of transients, unrestricted uses, and off-road vehicle traffic. Show Low recognized the economic benefits tourism tied to quality recreation areas would bring to the community. At this same time State Parks was looking for water-based sites in northern Arizona at higher elevations to meet the growing needs of residents and visitors. In 1991, the Apache-Sitgreaves National Forest, Arizona State Parks, Arizona Game and Fish Commission, the City of Show Low, Arizona Public Service Company, and McCarty Construction Company signed a Memorandum of Understanding (MOU). This MOU was entered into for the purpose of cooperating in the construction (if applicable) and the operation and maintenance of the Fool Hollow Lake Recreation Area for public recreation. A Partnership Agreement was also entered into pursuant to the MOU on May 5, 1991. The Partners are all of the above entities except the Forest Service. Through this MOU State Parks provided $1,000,000 and deposited it with the City of Show Low as its contribution toward the development of facilities at the Park. The Parks Board also provided operational and management support as funding became available. On June 4, 1992, State Parks received a Term Special Use Permit from the Forest Service on 580 acres surrounding Fool Hollow Lake. This Permit was amended in June 1992 to include an additional 74 acres making the total acreage 654. Construction of new facilities and improvements at Fool Hollow began in 1991. The facilities included campgrounds, picnic areas, restrooms, water system, roads, and parking areas. Some of the new improvements were completed after the grand opening. House Bill 2146 was introduced on January 11, 1994. This bill authorized Fool Hollow Lake Recreation Area as a State Park. It recognized that the facility was the result of an intergovernmental partnership with the Forest Service, Arizona Game and Fish Commission, and the City of Show Low. The bill established the development and management of Fool Hollow Lake and adjacent land as a State Park. The Governor signed this bill into law on March 26, 1994. 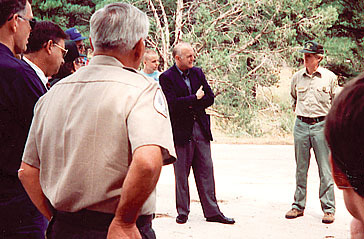 The successful partnership celebrated an official opening on Memorial Day 1994 for Fool Hollow Lake Recreation Area. Michael Sipes was the first Recreation Area Manager.